Put down your mince pie. Mull over that wine a little more. 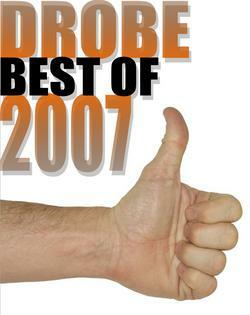 It's time to decide who's been naughty and who's been nice this year: it's the Drobe Best of 2007 Awards. We've drawn up a shortlist of nominees for you, dear readers, to vote on and pick who will be crowned Best of 2007. The closing date for votes is midnight December 30, so please take a look through the list below and vote using the online form here. The winners will be announced on December 31. Drawing up the shortlist was particularly difficult because a good number of developers have turned out some excellent improvements and updates to their products and applications this year. Whittling down the shortlist was no easy task, and, nominated or not, all contributions to the platform deserve high praise. Gutenprint: A collection of high-quality printer drivers ported by Martin Wuerthner. Formerly known as Gimp-Print, the software can handle over 750 devices and Epson inkjets in particular. ArtWorks 2.7: Top new features for this vector graphics package include support for documents with multiple pages and multi-page PDF export. The freely available ArtWorks-related utilities AWViewer and AWRender2 were also updated by Martin. Messenger Pro 5: As well as various tweaks and user interface updates, R-Comp's email and usenet client now prints emails in a more readable fashion and message searching and editing is faster. VirtualRiscPC: VirtualAcorn's RiscPC emulator is now available for Intel and PowerPC-powered Apple Mac computers and enjoyed some extra updates over the year including confirmed support for Windows Vista and RISC OS 6. TechWriter and EasiWriter: These word processing packages, now developed by Martin Wuerthner, gained a style editor and a style finder as well as a few other tweaks. DataPower 3: R-Comp took this database package under its wing and added a spell checker, threw in networking support as standard, improved the scripting engine and included other updates. Select 4 RISC OS 6: Following a preview release last year, 2007 saw the shipping of Select 4 release 2 by RISCOS Ltd. This version brought back printing support, included a new user manual, the enabling of Filer shortcuts, included a new Viewfinder hardware driver and added other features and improvements. Programmer's Reference Manual Volume 3 new edition: A 472-page reprint of the original Acorn PRM Vol 3 by RISCOS Ltd with new sections covering the technical details of features recently added to the RISC OS desktop. Ctorrent: Theo Markettos ported this file sharing BitTorrent client to RISC OS. TextEffX: Originally developed by John Whitington as Insignia, this bitmap graphics application was made 32bit compatible and then released for free via RISC OS dealer a4com. NetSurf: This year saw the release of version 1.0 and 1.1 of the open source web browser. Quicksand: Vince Hudd dashed around his local forest snapping photos to illustrate this new adventure game. PrivateEye: Dave Thomas's well-polished image viewer turned into an image editor this year. RPCEmu: Tom Walker's RiscPC emulator gained a huge speed boost from a new dynamic recompiler, as well as other improvements, and was ported to the Apple Mac platform by Jon Welch. Parmesan: Christian Ludlam surprised us all with the release of a brand new, freely available and stable MSN client for RISC OS. GCCSDK: The GCCSDK team turned out version 4.1.1 of the freely available C/C++ compiler, a new Autobuilder website, shared library support and more. CashBook: Steve Fryatt's feature-rich home accounting software was released this year. Castle shared source scheme: This year the RISC OS 5 shared source licence was unveiled, source code and binaries were released for download, and third-party developers fed much needed updates back into the operating system. Quake 2 port: Dave Brown produced a port of the 3D first-person shooter game using IyonixMesa to provide 3D accelerated graphics on Iyonix computers. Early Soundblaster driver: Simon Wilson ported a Linux driver to RISC OS to allow Iyonix computers to use Soundblaster Live audio PCI cards. Early VoIP client: Dave Higton made a start with a simple VoIP client to allow him to make phone calls over the Internet. Lego laptop: Peter Howkins built a semi-portable computer out of Lego, a 10-inch LCD screen and a butchered Acorn A7000. Flight-case laptop: Meanwhile, Paul Stewart crafted a more portable RISC OS computer out of an A9home in a metal flight-case. The deadline for voting has been extended to midnight December 30. Thanks to everyone who has participated so far. Nice to see a healthy bunch of improvements this year, and a couple of difficult choices to make. Nice to get another nomination! It reminds me to offer a quick update. Although I was unable to demonstrate the VoIP User Agent in October, I did demonstrate it successfully in November. I'm currently rewriting it in C using DeskLib. Progress is slower than I'd like, but positive. Does Ctorrent work with RISC OS, or more accurately, torrents? I tried downloading some "torrent" video with Netsurf but the download stopped after about 1K.